This does it! we're getting a generator. 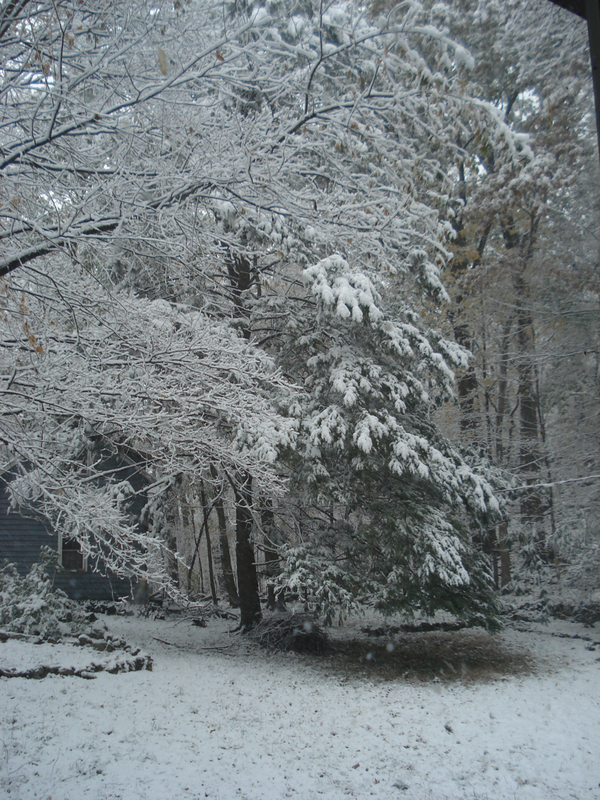 When we lost power in Hope for 4 whole days due to hurricane Irene back in August, i thought that it was unlikely to happen again for that long a period of time and then along came the October snow storm. On Saturday, I was working on the computer when suddenly the backup battery started to beep. Sure enough, the heavy rapidly falling snow caused trees and branches to fall on the power lines. I knew we were in for big trouble. It was hard not to notice the beauty of the snow on the new skylights, and on the trees and bushes so thickly powdered with snow, at the same time realizing that it was a dangerous beauty and the worst thing that can happen to trees, most of which still had their leaves, making them bow further and burther to the ground and rooftop. What to do! The roads were already too slick not to mention blocked with fallen trees, to risk driving back to New York. So my first thought turned to dinner. Two lamb chops were defrosting in the kitchen and I had also taken out some cauliflower and the last of the two small potatoes from my friends the Menegus's fall harvest. What I was lacking was oil or wine. I would not have opened the wine cellar in the summer but since the basement was about the same temperature as the inside of the wine cellar I risked grabbing out a bottle of Sicilian Nero d'Avelo. I trimmed the lamb chops of most of the fat and rendered the fat in a large cast iron pan in which I sautéed the cauliflower florets and cubed potatoes, sprinkled with salt, pepper, and a little curry powder. Luckily I have a gas cooktop. The lamb chops were grilled outdoors. I sacrificed an ugly decorative candle someone had given to Elliott over 35 years ago. 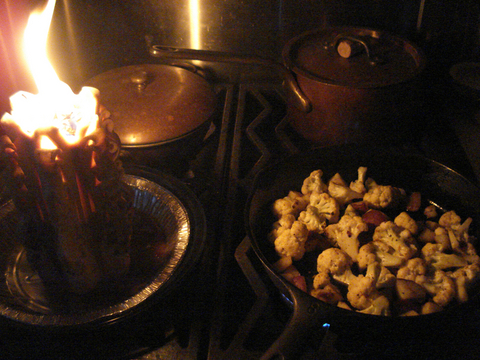 Luckily I had the foresight to set it in a disposable pie pan as it oozed melted wax while providing me with just enough light to avoid burning the vegetables. We sat down to a lovely candlelight dinner and went to bed early, covered with two down quilts. Sunday morning, Elliott shoveled the drive for our escape while I heated snow for tea. Until we reached route 80 the sides of roads were littered with fallen and broken trees. I felt so fortunate that we had suffered no damage but, of course, I fear for my treasures in the freezers as the power is not projected to be restored until Thursday of this week. Still, if it is cold enough, the food may stay frozen as I filled both the freezers and the refrigerators with plastic bottles of water, anticipating while not really believing the possibility of another power outage.